POHJV-05/JV-03/FIN MVA Wingdari Swaga Mischief - "Vilkuu"
This is the second time that "Vilkuu" has won this award at the International Show in Lahti and the third time being placed in a Herding Group in Finland. 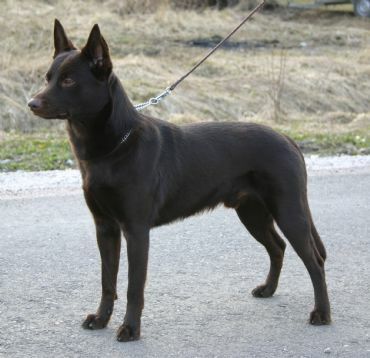 Apparently in Finland it is very rare that an Australian Kelpie is placed so high in a Herding Group. A quote from Heli's email from Finland - "Judge was Robert Lott from Australia and he praised Vilkku a lot. After the ring he came to ask where the dog was from and after he heard that Vilkku was breeded by you, he praised your breeding work and said that your dogs are great kelpies. In the group ring we got a bit excited because of Vilkku`s success and started to cheer, and after that also other judges came to praise Vilkku." JUNIOR WORLD WINNER AT THE HELSINKI SHOW. 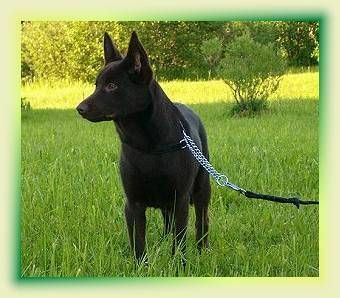 'Vilkuu' is now concentrating on his obedience and agility titles.